There are perennials for wet spots that will grow in poorly drained area in your yard. Such areas may have defeated your gardening efforts, but there are planting solutions. If you’ve looked at natural wetlands, you will have noticed that there are all sorts of plants that thrive there. 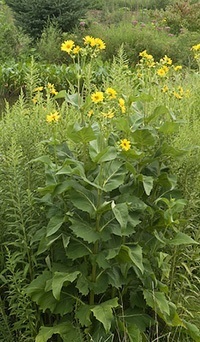 Most garden perennials won’t grow well if their roots are waterlogged for long periods of time. Excessive soil moisture displaces oxygen, which can cause roots to suffocate. However, the plants that are native to wetland areas have acclimatized to thrive under these conditions. By copying nature – choosing plants that flourish in moist places – you can turn your problem site into a garden asset that hosts beneficial species such as dragonflies, frogs and toads – even butterflies. You may have considered extensive drainage projects, but generally it’s less work and expense to choose plants that thrive in moist conditions. Consider using native species found in moist habitats in the wet spot in your garden. They are perfectly adapted to the water regimes of your region and most of the ones listed below are very hardy. 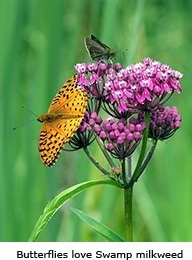 There are many moisture-loving plants to choose from, ranging from grass-like sedges and ferns to flowering perennials, such as Joe Pye weed, cardinal flower and swamp milkweed, which are all butterfly favorites. With the surge of interest in native plant gardening, these plants are now easier to find at nurseries and garden centers.